When this paragraph appeared in the local Hamilton, Ontario, newspaper, the reporter was not referring to the NHLPA but to a handful of players who refused to play in the NHL finals for the Stanley Cup over a matter of $200 a piece. 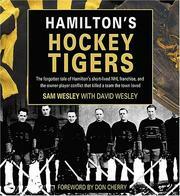 So goes part of the story of Hamilton’s Hockey Tigers. The professional Tigers – often referred to as the Hams or the Bengals to distinguish them from the OHL team of the same name – put Hamilton on the NHL map from 1920-1925. The story of the Hams incorporates much of the history the league, the teams, and the fans honor today. These Tigers exemplify so many of the same stories fans are accustomed to hearing – a Canadian team being bought and moved “south of the border” to an American market; names from the annals of history while they were early in their playing or coaching careers; Original Six teams first entering the league; and the eternal struggle between players and owners. Sam Wesley provided an interesting and well-researched account of the five seasons Hamilton hosted the fledgling NHL. The beginnings were slow-going with four seasons at the bottom of the league standings and their fifth and final season at the top. Wesley interspersed narrative and news reports in a balanced way, giving the reader both a historical and a “you are there” perspective. Image reproductions, from hockey cards and team photos to historic views of Hamilton, completed the stage for Wesley’s story. Scattered throughout the book one finds familiar names: Art Ross, a Tigers coach for one season; Howie Morenz, a promising rookie; Georges Vezina, an unstoppable goalie; and, Frank Calder, NHL president. The Hams final season coincided with the Boston Bruins’ inaugural season, and the Montreal Canadiens dominated the league. Four of those five years enjoyed by fans in Hamilton were the last years when the NHL saw an exclusively Canadian league. And, yes, the narrative proves the old adage “the more things change, the more they stay the same.” While expressing the issues the NHL dealt with in the 1920s, Wesley reminded his readers that these problems are reminiscent of the NHL today – a reputation for violence; antagonism between players and owners; controversy over rule changes designed to improve the game; and the continuing southward expansion of the league. Hamilton’s Hockey Tigers is one city’s short-lived experience with the beginnings of elite professional hockey. Anyone interested in the history of their favorite game would enjoy the Wesleys’ contribution to hockey lore.